The wonder fruit amla (Indian gooseberry) is highly valued by nutritionists and practitioners of indigenous medicine. This is scientifically known as Emblica officinalis or Phyllanthus emblica. Amla has been held in high esteem in indigenous medicine. It is acidic, diuretic and laxative in nature. 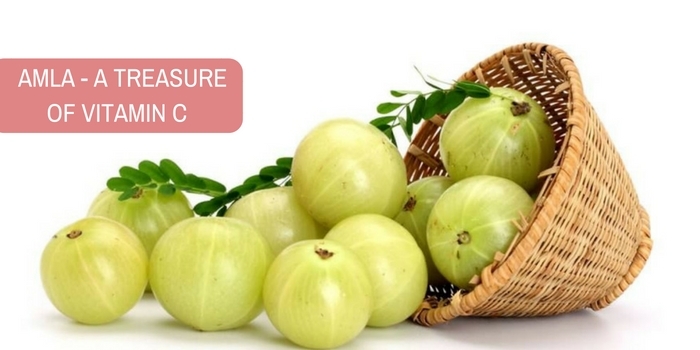 Amla is probably, the richest source of Vitamin C in fresh as well as dry states. This fruit contains a chemical substance, which prevents the oxidation of vitamin in it. The vitamin C in it is well conserved by preserving the fruit in solution or in the form of dry powder. This fruit is a rich source of pectin, thus useful in making jams and jellies. Ayurveda medicines to increase the Immunity? Its dried form is useful in hemorrhage, diarrhea and dysentery. It is also useful to treat anemia, jaundice and dyspepsia in combination with Iron. Amla is one of the three ingredients in Triphala. This compound is used in the treatment of headache, biliousness, dyspepsia, constipation, enlarged liver and ascites. It strengthens heart muscles and reduces the risk of cardiovascular diseases. It improves body resistance and provides nourishment to the nerve and is helpful in paralytic condition. Amla combats urinary problems and helps in improving the quality of sperm due to its sweet vipaka property (taste conversion). It is also helpful in respiratory problems and lowers cholesterol levels and blood sugar levels. It strengthens teeth and nail. It helps in boosting memory power. Do you have a question on Vitamin C or Amla Dried? Can excess intake of vitamin C induce periods?